Approximately 700 people participated in a solidarity demonstration in Göttingen on Saturday for the young antifascist who is currently wanted by the police for refusing to voluntarily give a DNA sample (Read the background information on the issue here), in defense of left-wing and autonomous structures, and against state repression. The demonstration can be considered a clear political victory, not only because of the large turnout, but also as the wanted comrade was present from beginning to end of the demonstration, a fact which was made unmistakeably clear several times from the loudspeaker car. Despite this, attacks on the demonstration, either with the objective of making arrests or simply, as claimed in the police report, because of too many people being masked, were effectively defended against and no arrests were made. Several people were however injured (not seriously) due to baton impacts and massive use of pepper spray. The police on the other hand report being „attacked“ with flagpoles. Furthermore, the offensive character of the demonstration was noticeable in the signifcant amount of firecrackers and fireworks which were used, even after the repeated police attacks. These are a clear sign of solidarity with the accused comrade. The demonstration, led by a large black bloc of ca. 400 people, was supported by almost thirty groups from the city of Göttingen, as well as over a dozen from other cities. 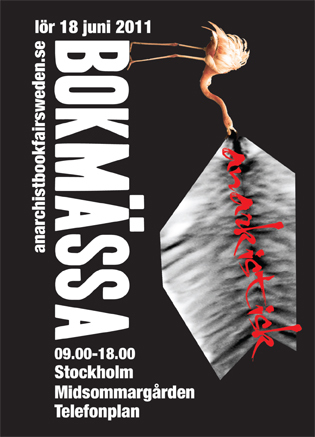 This represented a wide spectrum ranging from anarchist groups, to autonome antifascist groups, to the youth of the Green Party and SPD, as well as the local branch of Green Party. 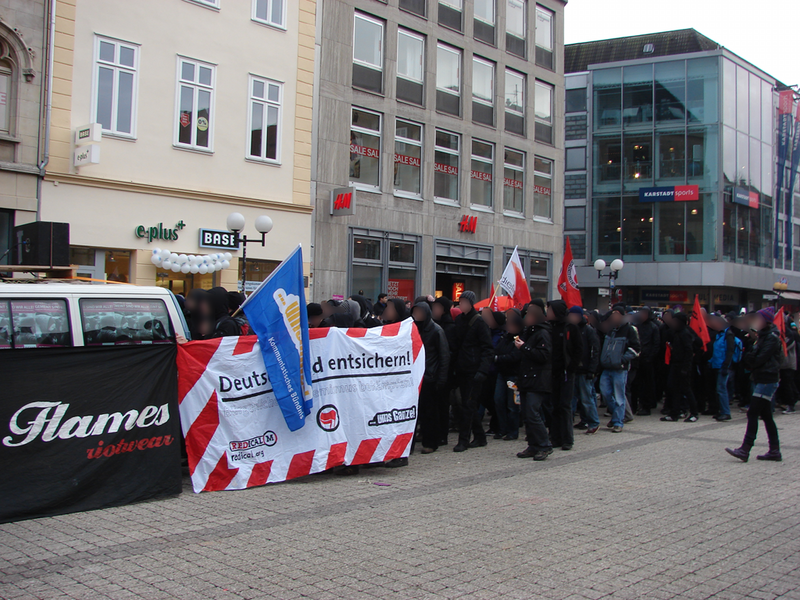 During the course of the route, which went across Göttingen and made stops at the prosecutors office, the police station, and city hall, speeches were made from the Antifaschistische Linke International, the Jugendantifa Göttingen, a local antiracist group, as well as the Rote Str. 3 (roommates of the comrade in question), and a statement from the wanted comrade explaining his decision and thanking everybody for their solidarity and support. You can find more detailed reports (in German) as well as more pictures, at the ALI webpage and at Monsters of Göttingen. To read what is without question one of the most creative, entertaining, and just plain crazy summaries of the demonstration, we strongly suggest a visit to buergerstimmen.de Laughter guaranteed! For the historical record we would like to say that, while we are of course very much in the middle of this issue and this campagin, it is still *not* our practice to take our banners to demonstrations! The only explanation here would be that, after the benefit party which we organized together with the ALI a few weeks ago, our banner was simply packed away together with theirs, and then re-appeared at the demonstration. Whatever the case may be, we would like to have it back please! Finally, please remember that our friend is still wanted by the police, as was made clear by the fact that on Friday they visited a home in Berlin looking for him, and any day could be „Day X,“ as in the day he is taken to the police station. For this day, the Antifaschistische Linke International is calling for a demonstration at 18:00 in the Göttingen marketplace! Du browst gerade in den Fire and Flames Weblog-Archiven nach dem Tag 'martin-r'.